Summer is a time of year everyone looks forward to. The garden is growing. Children are on holiday. There are reunions, picnics, cookouts. Everything is great, with the possible exception of the heat. One way I’ve found to beat the heat is with fun and delicious drinks made from ingredients growing in my yard. They’re great to drink and serve to your family, and a lot of them are great for the get-togethers that always seem to happen in the summer. A smoothie is a terrific way to start your morning. You get a quick boost of nutrients, which otherwise might take all day to consume, and it is very refreshing. Keep an open mind when deciding what to put in your smoothie. A lot of vegetables are really very sweet, but we are not used to thinking about drinking them or having them first thing in the morning. Anything you put in a blender, with a little water or juice, will make a smoothie. If you want more of an ice-cream texture, add a frozen banana. I keep a plastic storage bag of sliced bananas in my freezer. I can toss a handful of frozen banana slices into any smoothie recipe and I will have a thick, frozen drink without affecting the flavor too much. You do not need an expensive, specialized machine to enjoy homemade smoothies and frozen drinks. Just be nice to your blender and chop whole fruits and vegetables into manageable pieces. Add a little liquid and start on low speed, working your way up to the highest speed. Some great blends to try are: baby spinach, banana, and cranberry juice; kale, apple, and apple or pear juice; beet, apple or pear, and water; banana, blueberries, and milk; banana, peach, and orange juice. Have fun experimenting with different flavors. You will notice a real difference in your energy level once you incorporate nutrient-dense smoothies into your morning routine. One of the hardest things for me to do is to drink enough water. Keeping a pitcher or two of infused water in my refrigerator is an easy way of encouraging everyone to drink water throughout the day. Water is important all the time, but it is especially important during the summer heat. There are more accurate ways to calculate it, but, a person needs to drink about half their body weight (in ounces) per day. For example, a person who weighs 200 pounds should drink about 100 ounces a day. To infuse water, simply add any fruit, vegetable, or herb to a pitcher of water and store in the refrigerator. Try sliced lemons, limes, oranges or peaches. There are interesting varieties of mint, such as apple, chocolate, or pineapple mint, that lend themselves nicely to infused waters. Try other flavors that you personally enjoy. Cucumber water, for example, tastes a lot better than it sounds. In the South, you cannot go into anyone’s home without being offered a glass of sweet tea. Everyone has their favorite recipe, but the main difference is usually just the amount of sugar. I was very excited the first time I tried sassafras tea. It has a beautiful, rich flavor that leaves plain sweet tea in the dust. Sassafras is a tree that grows all over the South. The leaves are used to make filé, a flavorful thickening agent used in certain types of gumbo. The roots are used for a slightly spicy addition to tea. Because the tree is a self-propagating machine, I will pull one or two out of the ground each year and harvest the roots into chunks that will easily fit into a kitchen pot. 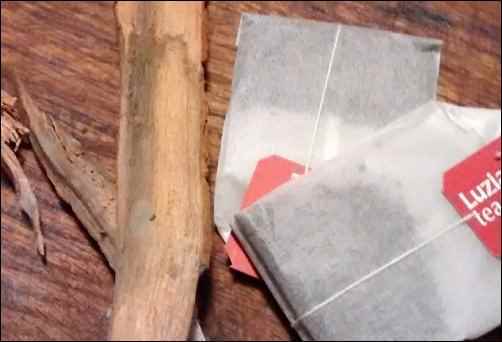 Add a couple pieces of root and 2 family-size tea bags to a pot of water. Allow the water to simmer, but not boil, until the tea is dark and your house smells like sassafras. Pour into a pitcher, straining out and saving the sassafras root. Sweeten as desired. Allow the root to dry. You can use the same root piece several times. Another way to serve tea is with a shot of mint simple-syrup. It is a delicious treat that can be added to lemonade as well as tea. To make a mint simple-syrup, muddle a handful of mint into 3 parts sugar while bringing 1 part water to a boil. Add sugar and mint to the boiling water. Stir constantly, until the sugar has dissolved and the water is a thick, syrupy consistency. Strain the mint leaves out of the syrup. Let cool. Transfer to a clean glass jar and cover tightly. Stores for a few weeks in the refrigerator. Blueberry soda-syrup is another sweet treat to have on hand. Unlike mint simple syrup, which is pure sweetness, blueberry soda syrup is tart and tangy. Bring the blueberries, water, and lemon juice to a simmer in a saucepan over medium heat. Allow to simmer for 10-15 minutes, until the blueberries have burst. Strain through a fine-mesh sieve, using the back of a wooden spoon to press out as much of the liquid as you can. Return the strained liquid to the saucepan. Add the sugar and citric acid. Bring to a boil over medium-high heat for 5-10 minutes, until the mixture has thickened. Remove from heat and allow to cool before transferring to bottles or jars. This will keep in the refrigerator for up to one month, or you can process it in canning jars in a boiling-water bath for 10 minutes and use it year-round. To use, add 2-3 tablespoons to a glass of club soda or ginger-ale. 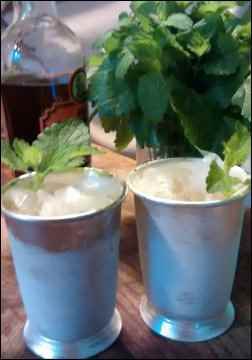 Everyone is familiar with the mint julep, the favorite drink of the Kentucky Derby. 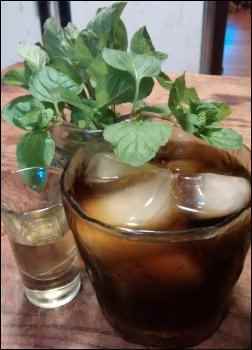 Any herb can be used for a julep, however, and since my lemon balm is having a great year, I decided to try lemon balm juleps. Into the bottom of a silver julep cup, or a Mason jar, press 2-3 tablespoons of superfine sugar together with just enough water to make a sugary paste. Add a layer of fresh lemon balm leaves. Press them gently with a wooden spoon, but do not smash them. Pile on a layer of finely crushed ice. Top with a sprinkling of sugar and then a few more lemon balm leaves that you have bruised, but not crushed, by clapping them between your hands. Repeat the layerings until the glass is full. Pour the bourbon over the layers and enjoy. The prickly pear cactus is a thing of beauty when it is in bloom. Once the flowers bloom and fade, dark purple fruits will appear. Prickly pear syrup makes beautiful and delicious drinks to serve to a gathering of friends. Gloves are the first line of defense when you are harvesting prickly pears, but you should also pick and handle them with metal tongs – the spines really do hurt. Use a vegetable scrubber to remove the spines. Cut off both ends of the fruit and make one cut from top to bottom. Slice the skin off the fruit. Chop the fruit and combine with the water and sugar. Bring to a boil. Use a fine-mesh sieve to separate the seeds and pulp from the syrup. Store the syrup in a glass jar in the freezer. Adding 1 ounce of vodka will keep the syrup from freezing solid. Add a splash of this to sparkling wine or to your favorite margarita recipe. For a non-alcoholic version, omit the vodka and add a splash of the syrup to mineral water. Elderflower cordial is a recipe I found in Amy Stewart’s The Drunken Botanist. It has a delicate and floral taste which can be added to practically anything. Bring the water and sugar to a boil and allow to cool. While it is cooling, go outside and cut fresh elderflowers. Shake gently to evict any bugs. Bring indoors and use the tines of a fork to separate the flowers from their stems. Combine all ingredients in a large bowl and let sit for 24 hours, stirring and tasting as necessary. After 24 hours, strain the mixture into clean, sterile Mason jars. Store in the refrigerator for up to one month, or in the freezer indefinitely. You can add a splash to any drink, alcoholic or non-alcoholic. Substitute elderflower cordial for the tonic in any recipe using tonic as a mixer. If you are planning a party where alcohol will be served, consider stocking your bar with vodkas you infuse yourself. It will save you money, while highlighting the products that are growing in your garden. It is super-easy to infuse your choice of herbs, spices, and fruit in vodka, which can stand alone as a drink, or can be used for cocktails. Remember that tender plants such as herbs do not need to be submerged for a long time – they will develop an off-taste. For herbs, 8-12 hours is usually long enough to impart their flavor. Most fruit should take not much longer than a week. If you are using citrus rinds and dry spices, you can probably leave them soaking for a month. Taste your concoction frequently and strain as soon as you are happy with the flavor. To make an infused vodka fill a clean jar with herbs, spices, or fruit. Cover with an affordable vodka. Cover tightly and store in a cool, dark place. Taste regularly. Strain and use within a few months. Enjoy the blessings of summer with one or more of these garden drinks. Happy Summer!